Our Spring 2010 Tour of Autumn Gem got off to a great start last night at the University of Nevada, Las Vegas. 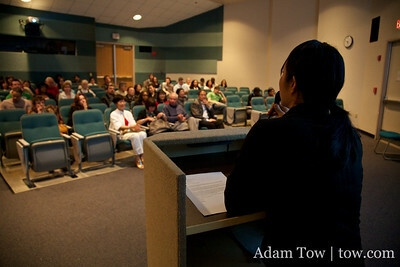 The screening was held at the Marjorie Barrick Museum Auditorium / Harry Reid Center for Environmental Studies (or MSM/HRC for short) and was sponsored by the Asian Film and Drama Club, Asian Studies Program, Department of Foreign Languages and the Las Vegas chapter of the US China Peoples Friendship Association. We first got the idea to come to Las Vegas after meeting with UNLV’s Joan Mann when she in San Francisco for the USCPFA’s National Convention last September. Big thanks go out to her, Cynthia Tripp and Professor Ying Bao for organizing! Did Qiu Jin see herself as a poet or literary figure? We certainly feel this was the case. Qiu Jin left behind 200 poems and writings following her death. What prompted us to do the film and how does it relate to today’s sociological issues? Introducing the story of a influential Asian feminist to a Western audience was a driving force behind the project. We certainly feel her example still is relevant to women today. Are we talking to PBS or the History Channel to get this film shown on television? This is certainly one of our long-term goals for the film. I was last in Las Vegas back in January for the CES conference. I was so busy with work that I didn’t have much time to enjoy the sights and sounds of the Strip. Following Tuesday’s screenings, Rae and I were able to catch the Cirque du Soleil KA show at the MGM Grand. The two main stars of the KA are friends with our actress, Li Jing. We’ve been fortunate to know so many artistic and creative people who are able to make a living doing the things that they love, be it in music, photography and performing arts. The KA show was really quite a spectacle, and I absolutely loved the giant moveable stage that could go from horizontal to vertical! Here are photos from the UNLV screening of Autumn Gem. Our next stop is at the College of Southern Nevada on Thursday. Then, we’re headed to Arizona State University in Tempe, Arizona.